When architecture, engineering and construction professionals need a way to visualize a real-life structure on a computer screen, they turn to Autodesk ReCap. A high-powered reality capture software, ReCap can transform brick and mortar into 3D models and 2D drawings ready for further design. A valuable application for AEC professionals, ReCap is ideal for those who renovate or expand existing structures. Project stakeholders, before they can add on, need to know what they're dealing with. Whereas studying structure blueprints would be a significant investment of time and money, ReCap users can utilize the software to incorporate and visualize data from laser scans and UAV photos. This seamless conversion of reality into workable 3D models and 2D designs gives users a huge cost and efficiency advantage. Further, ReCap can be paired with other Autodesk applications like AutoCAD and Revit to heighten creative capability and collaboration. AEC professionals must always be conscious of what hardware they use to power application performance, so configuring the right ReCap workstation is critical. Capturing and converting structures from real life essentially amounts to parsing and visualizing a significant amount of data. Understanding the data requirements of projects is central to identifying the best ReCap workstation to use. If your point cloud data is measured in megabytes instead of gigabytes, for instance, this roughly means data is on the lighter side. Light point cloud data, as our tests show, does not stress workstations with several CPU cores. This makes workstations like the APEXX S3 optimal models, as they include sufficient CPUs professionally overclocked to higher frequencies (necessary for CAD design). The smallest professional workstation, APEXX S1 features an overclocked Intel Core i7 with up to eight cores for demanding 3D content creation, CAD design, motion media, and more. If you have limited desktop space, work in an open environment where aesthetics are a high priority, and your graphics card is mainly used for display, this is your workstation. Typically ships in 5 - 7 business days. Please refer to the Ship Date on the emailed receipt upon order completion. Optimize your 3D design, CAD, and motion media workflow with APEXX S3 featuring a 9th Gen, overclocked, eight-core Intel® Core™ i7 or i9, along with support for multiple professional GPUs. If you require a full-size GPU for light GPU compute or VR, need increased storage and prefer upgradability, our flagship workstation is ideal. Typically ships in 8 - 10 business days. Please refer to the Ship Date on the emailed receipt upon order completion. Delivering rock-solid performance for a variety of content creation tools, APEXX T3 features an AMD 32-core Ryzen™ Threadripper™ 2nd Gen processor. The APEXX T3 family is a versatile platform for demanding 3D content creation workflows. In addition to the blazing fast CPU, the T3 offers ample memory, up to three professional GPUs, and plenty drive capacity. Typically ships in 18 - 20 business days. Please refer to the Ship Date on the emailed receipt upon order completion. Whether you’re editing feature films or deploying cutting edge VR experiences, the APEXX X3, with support for up to two graphics cards and 128GB of memory, is an ideal platform for extreme multi-tasking in your complex production pipeline. A dense point cloud means that your workflow consists of manipulating and processing large, complex datasets which can seriously strain your workstation. Fortunately, because Recap is multi-threaded, AEC professionals can accelerate manipulation and viewport interaction by increasing the number of CPU cores. 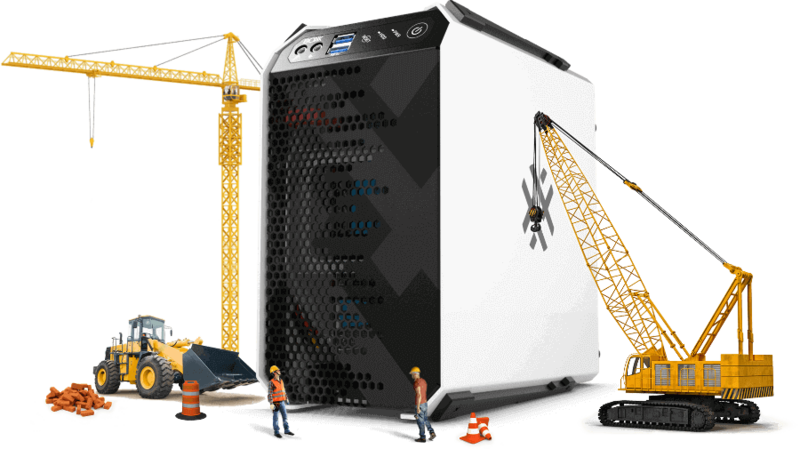 With just a single high-performance Intel® Xeon® W processor (not two) capable of supporting four professional GPUs, the APEXX W4 maximizes productivity and ROI. Typically ships in 13 - 15 business days. Please refer to the Ship Date on the emailed receipt upon order completion. ReCap is often used (necessarily) with other CAD or BIM apps including AutoCAD and Revit. However, such pairings, when not supported by the right ReCap workstation, can cause computer bottlenecks that drag on workflows. This can happen when editing ReCap point cloud data (which utilizes multiple CPU cores), then switching over to a single threaded application for 3D modeling and design. Factoring in both needs is important when searching for a Revit computer. The best Revit workstations accelerate both types of creative processes. At BOXX, we’re engineers and creative professionals too. In fact, we rely on SOLIDWORKS, 3ds Max, and other applications every day. Our chassis are designed by BOXX engineers and proudly manufactured in the USA, but they aren’t built for sending emails or gaming. They’re crafted out of quality aluminum and steel strengthening components. That means maximum airflow and cool, quiet operation—even with the most demanding hardware configurations. At BOXX, we understand that you need to be back working just as soon as possible when something goes wrong. That's why YOUR productivity is always our top priority. Our in-house technical support operatives will attempt to recreate any issues you have in an effort to reproduce even the most obscure problem. We'll even overnight parts when necessary during your premium warranty period. Keep working while you render! BOXX offers unique hardware packages specifically designed to reduce the bottlenecks that plague professional software applications. By offloading your rendering, simulation, or other multi-threaded tasks, creativity never has to be put on hold by your hardware. That's the philosophy behind The BOXX Workflow. We understand that it's important to know where your money goes when purchasing a premium workstation. BOXX offers services and solutions that go far beyond what you'll find at Dell, HP, or Apple.